Hello, is it me you’re looking for? Meet Emma! I can see it in your eyes, I can see it in your smile, you’re all I’ve ever wanted, and my (kitty) arms are open wide. Meet me, sweet Emma with the golden speckled eyes. I was rescued from an outdoor colony caretaker’s home when my keeper moved away. I am a bit shy at first, but give me a few head scratches and my purr motor starts up right away. I would be most comfortable in a quiet home without young children. I would love to sit on your lap and purr the day away. 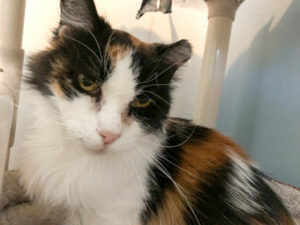 Contact Wild Blue Cats to meet me today, just ask for me, sweet Emma! PreviousPrevious post:Meet Traci the May Volunteer of the MonthNextNext post:Look Deep Into My Eyes…Kristoff Says You Will Adopt Me! Meet Dahlia, our special needs girl! Oklee, our super sweet big guy! He’s an orange beauty…..Uncle Ector is looking for a quiet home. Copyright © WBCats! All Rights Reserved.